Shelley Winters’ demise in The Poseidon Adventure was one of the highlights of that movie. While it’s nice to meet her again in another 70’s disaster flick, this time neither her character nor the surrounding movie is quite as compelling. Taking its cues from the classic Irwin Allen school of disaster movie structure, City on Fire uses the ridiculously interconnected lives of too many characters to tell the story of a nameless city being ravaged by uncontrollable fire. We get an early teaser about what is to come as a group of kids sneak up into a tree house to smoke cigarettes. One of the boys chokes on the smoke and drops the cigarette, causing his own house to catch fire. His little sister is caught inside and is rescued by a pair of brave firefighters, one of whom gives his life in the process. (Meanwhile, the World’s Officially Most Annoying News Reporter covers the drama on site.) Unproportionate time is spent on this episode, given that it is basically irrelevant to the rest of the film. It’s an indication of the kind of problems afflicting this movie. The real action starts later. This nameless city has been blessed with a large chemical refinery which, rather unusually, is located in the middle of the city — actually, as it turns out, not that far from a newly constructed hospital. Good city planning there. A maintenance worker named Stover (Jonathan Welsh) loses his job and decides to get his revenge by running around the plant like a madman, opening any valves and throwing every switch he comes across. Some kind of very flammable liquid leaks into the sewers where a couple of workers do some welding, and you can guess what happens next. It doesn’t take long before the entire city is rocked by explosions as the fire spreads. From that point, the action focuses on the new hospital, where most major characters converge — including crazy guy Stover, the mayor (Leslie Nielsen), a dashing surgeon (Barry Newman), and a beautiful socialite (Susan Clark). Oh, and the nurse played by Shelley Winters, of course. As for the fires, I had expected more. Apart from the explosions rocking the refinery, there isn’t very much fire going on until the end, during the evacuation of the hospital. However, most of the fire is confined to one single street set, which looks okay but gets a bit over-used as the evacuation sequence goes on for so long it actually gets boring. 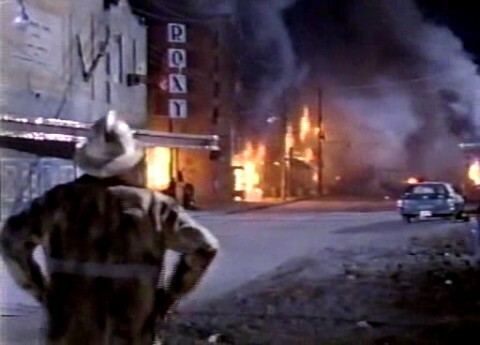 In a movie called City on Fire, I had hoped to see a bit more of the actual city actually on fire. The pacing is generally slow, the director frequently wasting time on irrelevant details or less than thrilling subplots. The most annoying of these features Ava Gardner as an aging, alcoholic television presenter, who reports on the crisis live on the air (while not busy chugging gin in her dressing room), reading updates in a despondent voice against a pitch-black background. You know, just like they do on CNN. There’s also good old Henry Fonda, who ended his career with, among other things, a bunch of disaster flicks, including The Swarm, Meteor, and this one. His job here is basically the same as Jimmy Stewart’s in Airport ’77 (or Bruce Davison in Megafault, for that matter); standing around looking worried, staring at screens or maps and talking on the phone. He plays the fire chief but is mostly as disconnected from the rest of the plot as Ava Gardner’s character. If the action had been better held together and the whole thing trimmed down some, I believe I might have given this one a slightly higher rating; it’s a bad movie, but if you take it for what it is, it has some entertaining moments. Problem is, they are too few and far between. I also love this movie though I know that sounds nuts. It’s horrible and the most sympathetic guy is Herman the arsonist but….hey! It’s a blatant ripoff of “City on Fire”–same plot, same everything! They even go so far as to lift scenes from the older movie and use them! Unbelievable! A must see (just for the sheer audacity of the producers). Not a great film, but not an awful film either. I don’t think this will be released on DVD any time soon. I had brief communication with director Alvin Rakoff, and he said he doesn’t personally own the film. He wasn’t sure how the film will be handled in the future. I remember watching this masterpiece (joking) as a kid in the mid 1990’s, I think it was on late one night and I set the video to record it, anyway for a long time it stuck in my mind and recently found it to watch online. Yes it isn’t a great film by any means, it’s cheap and not particularly cheerful, but for some reason I’ve watched it a few times, must be a guilty pleasure! What I do like about the use of stock footage for the fires is how they are used, it’s quite clever, as a lot of the storyline is set in a television station we get to see the destruction through the screens in the control room, as if we were watching with the crew. So here is link to this hard to find film. Warning it contains scenes of destruction, people on fire and perhaps more scarier than anything a drunk Ava Gardner using the F word!